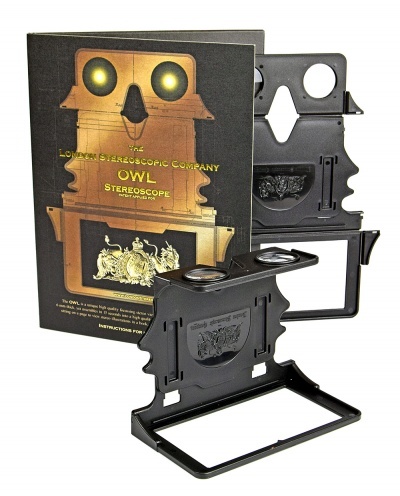 The patented OWL, designed by Brian May, is a unique, high quality, stereo focussing viewer, which packs into a space only 6mm thick, yet assembles in 15 seconds into a rigid precision instrument which is equally at home sitting on a page to view stereo illustrations in a book, or used in the hand as the perfect viewer for stereo cards - classic or modern. It comes packaged with complete instructions in a beautifully designed card wallet. OWLS are Made in England ! The new version of the OWL features a wider aperture in the back plate - as suggested by Stereo World editor John Dennis. This makes no difference to the OWL's performance in viewing stereo cards, but it enables the viewer to cover the whole area of larger format cards when they are illustrated life-size in book and magazines. Usually these are cards made much later than the "Scenes in Our Village" and "Diableries" cards … for instance Keystone Views, and Underwood and Underwood, and many 21st century stereo pairs now being offered. So the OWL now covers more formats than ever. But perhaps the most significant advantage of the new Version 2 OWL is that it is perfect for viewing side-by-side stereos on the iPAD. In the coming months, this is going to become more and more significant. The newest version of the iPad has a much better resolution than the previous models. In my opinion it's still not quite fine enough resolution for our purposes. It would be a lot better if we stereoscopists could use the whole area of the screen for our stereo pairs, but that's very hard. The geometry of the Brewster system - which is really what we are all using, dictates strict limits for the size of our images. Well, we shall see - but in the meantime our OWLs will be a great tool for enjoying electronic stereos on our iPads. OWL in position for viewing the stereo cards illustrated in "A Village Lost and Found"
This picture demonstrates the method of focussing the OWL. This was a prototype - with nuts and bolts ! Thursday, 18 May 2017 | G.J. It is light, foldable and has good quality glass lenses. I use it daily to enjoy 3D shows and video's on my smartphone.